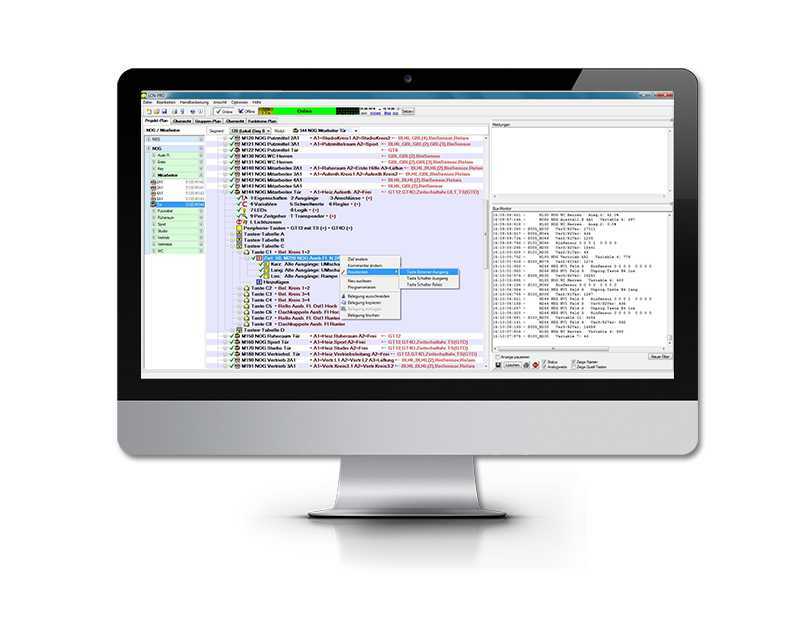 LCN-PRO is the Windows-based LCN software for programming LCN modules. Apart from setting parameters the software controls errors and protocoll functions for the LCN system. The software has two modes, online and offline. In the offline mode the system is pre-configurated and placed in a data base. Later, when a connection is established the parametrization is transferred to the project. The user can set up standard programming and put it into a library and place it at will via “Drag” and “Drop” into LCN systems. The LCN-PRO is based on a data base (project data) where the programming (setting of parameters) for the LCN modules is placed and stored. The LCN-PRO can programme as many projects as requested. Each project gets its own project data base. With the LCN-PRO it is possible to cut, copy and paste parameters, useful for keytables where the same data can be used again or even for entire modules. When offline, the set parameters are placed in the project data base. On setting up a connection to the LCN system, they are then transfered over to the corressponding modules. When online, all changes are transferred to the data base and the corresponding LCN module is then programmed.